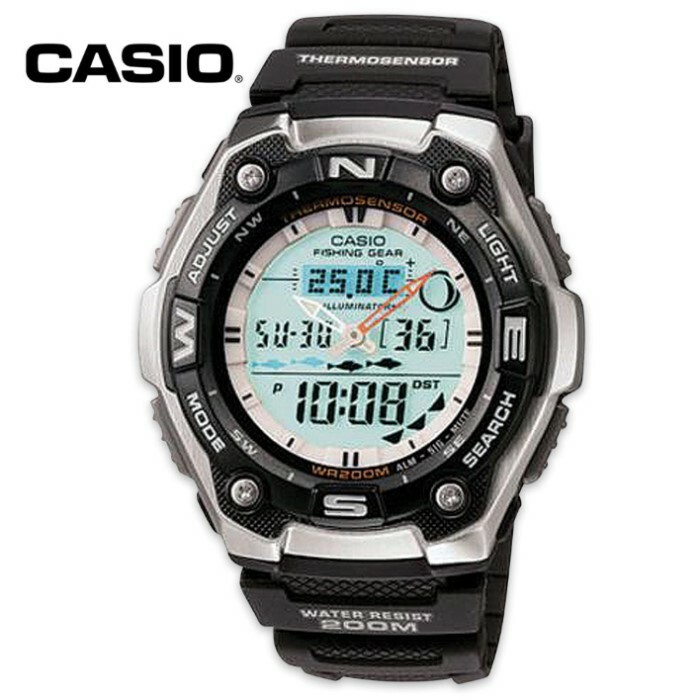 Casio Fishing Timer And Moon Watch | BUDK.com - Knives & Swords At The Lowest Prices! Make sure you have the Casio Fishing Timer and Moon Watch with you on your next diving or fishing expedition! It is water resistant up to 200 meters and includes a fish indicator and a moon phase graph and the moon age of input data. When you use the fishing mode, it will tell you the suitability of a specific date and time for fishing, as indicated as one of five levels from suitable to not suitable. This is calculated in accordance with moon transit and phase.The EL backlight with afterglow makes it super easy to read and an innovative Active Dial adds a touch of three-dimensional depth to the face. It also features a thermometer, temperature tendency graph and temperature memory for up to 50 temperature records. This watch has a 1/100 second stopwatch and a countdown timer, too.